How traditions change. It used to be that when two people were in love, they got married and then moved in together. Did that work for everyone? Well, no. There were divorces and separations, and all kind of compromises, such as staying together "for the kids." Growing up, I was a child of divorce. My mom had been married once. My dad three times. When I was a sophomore, I began dating a guy whose mom had been married twice and whose dad had been married three times. We were both convinced that we'd have to live with someone first before getting married - just to improve our chances of staying together. We lived together for two years, and then got married. I'm happy to report we've been married for 32 years (a combination of love, hard work, and luck). Five years ago, my oldest son wanted to move in with his high school girlfriend. They'd been together for three years and were still going to college. We approved given our experience, but her parents did not. They insisted the couple get married. Mason and Hillary celebrated their 5th wedding anniversary yesterday. Last fall, my daughter's boyfriend of two years moved in with her at college. They plan to finish college and graduate school before they get married, mostly because her boyfriend is determined that he pay his own way after graduation - student debt, "new" car, even paying for the wedding and honeymoon (gotta love this guy for wanting to be financially responsible). Her boyfriend's parents spent a few months trying to talk them into getting married. But they've chosen their own path. Although I haven't watched the "reality" TV series arranged, I am intrigued that a couple would commit to each other without knowing each other well, or knowing the families they are marrying into. Harlequin tells me the marriage of convenience romances still sell well - another path to matrimony, although I haven't heard of anyone doing this lately. I believe each couple should choose their own path. What's appropriate today isn't always appropriate tomorrow. In this world of tension, I hope we can all keep an open mind about the choices others make that don't directly impact us. Melinda Curtis is an award-winning, USA Today bestselling author. 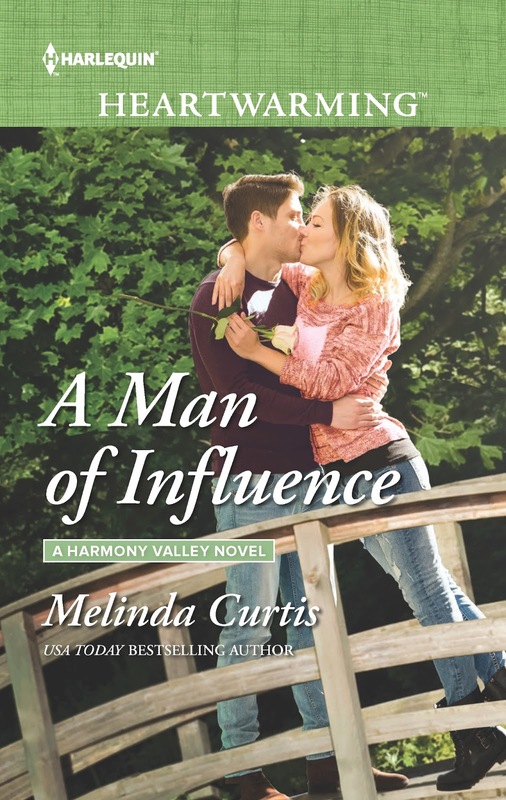 Her latest release, A Man of Influence, is a sweet romance set in the light-hearted Harmony Valley, where the Silent Generation used to do things differently. Very well said, Mel. I agree that couples should choose their own path. And...my dh and I have also been married many, many years! I agree...we should all choose our own paths. I met my husband when I was 17 years old and we were married when I was 20. I came from a divorced home and knew that divorce wasn't an option for me, but neither was living together before we were married so we took that major step. It hasn't been all easy, but he is my best friend and wonderful hubby(28 years) and I wouldn't change it for the world. I also have been happily married for many many many many years... I met him at eighteen, dated for two years, got engaged at 20 and married at 21. We never lived together before our wedding. My parents, his parents, and all grandparents would have disowned us! This is what makes romance endlessly fascinating - everyone has to find their own path, and there's an unlimited number of them!